After nearly a week in space and successful rendezvous with the International Space Station, SpaceX's Crew Dragon capsule sailed into Port Canaveral late Saturday and brought full circle its premiere mission for NASA. About 100 people watched from Jetty Park Pier around 9:30 p.m. as the spacecraft fresh with re-entry scorch marks was moved into the Navy's submarine basin for eventual transport to and processing at SpaceX's Cape facilities. 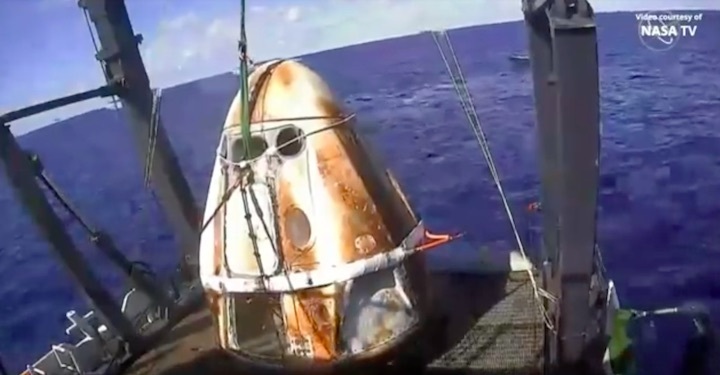 The company's Go Searcher ship is responsible for Crew Dragon's post-splashdown transport. The arrival wraps up a successful demonstration mission for the capsule that SpaceX designed specifically to carry astronauts to the ISS. After launching from Kennedy Space Center's pad 39A at 2:49 a.m. last Saturday, it spent about five days at the station before its early Friday de-orbit burn and Atlantic Ocean splashdown. "The vehicle really did better than we expected," NASA's Steve Stich said after splashdown. "It really sets us up for the rest of the year, and it’s a super exciting time to be in commercial crew." Crew Dragon didn't have a crew this time around, but SpaceX's next mission to the ISS with the capsule will carry astronauts. If it does happen as planned in July, it will mark the first time humans launch to the ISS from American soil since mid-2011. July is an important month in spaceflight: It marks the 50th anniversary of Apollo 11's historic flight to the moon and the space shuttle's final mission. SpaceX could capitalize on those historic mile markers. Both SpaceX and Boeing were selected to launch astronauts to the ISS under NASA's Commercial Crew Program. The latter is planning to launch its Starliner capsule on a similar uncrewed demonstration flight in April before a crewed mission no earlier than August. It has contracted with United Launch Alliance to launch the capsule on an Atlas V rocket from Cape Canaveral Air Force Station. The Space Coast's next launch, meanwhile, has been rescheduled to Friday, March 15. A ULA Delta IV rocket will take the Air Force's 10th Wideband Global SATCOM communications satellite to orbit at 6:56 p.m. from the Cape's Launch Complex 37.